So I want to go over the collections from MAC being released this month and what I want from each one. The first one is the dazzleglass collection. Now I know these are now permanent, so I might not get all of these at once, but since I love dazzleglasses so much I want A LOT of them. These are already available in most stores and I am not sure when they will be available online, but probably April 30th. Fix+ Rose - An aqua-spritz of vitamin and minerals, infused with a calm-the-skin blend of green tea, chamomile, cucumber, topped off with the fresh, natural, energizing scent of Sugi. Adds radiance, finishes makeup. From this collection I want Mutiny Pigment FOR SURE! This came out with the Naughty Nauticals collection last summer and I didn't buy it full size, and I regret it. It is the PRETTIEST shimmery turquoise, and one of my favorite blues ever! I also want the gel blush and at least one of the see thru lip colors, probably "Loving Touch". I am excited about these collections and hope you guys are too!! Let me know what you end up getting! So Summer is coming up, and with that comes bright nail polish! I have officially put away my favorite dark polishes like Opi's Lincoln Park After Dark in favor of bright pinks, corals, and tangerines. Today I am wearing Opi's Strawberry Margarita and China Glaze's Temptation Carnation. First apply a clear base coat, I use one from Sally Hanson. Then apply a hot pink color to the tips. I used Opi's Strawberry Margarita but you can use whatever you have laying around! I did this free-handed, I just took my time and painted the tips (it didn't take more than 20 seconds a nail). 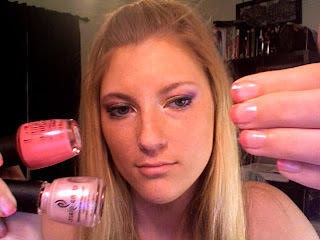 Then apply a light pink shimmery color all over the nail. I used China Glaze's Temptation Carnation. The lighter and sheerer your color is the best this is going to work. You don't want to distort the hot pink too much. Forgive the low quality picture, my camera broke and this is off my computer's webcam (aka - not good). I am going to be buying a new camera soon so I can take better quality pictures!